It seems to happen every year–everyone makes these great New Year’s resolutions and goals, start off strong in achieving them, and end up slacking off by the third week of January. You wouldn’t be the only one that this happens to. Scientists agree that it takes approximately three weeks for the average person to form a habit. This means, for three weeks, you need to keep up with your goals before it becomes automatic. For a lot of people, goals can be broken down into three sections: saving money, paying down debt, and losing weight/getting healthy. The easiest way to keep working hard at these general long-term goals is to break each goal down into smaller, more easily achievable steps. Instead of declaring, “I’m going to pay off $10,000 in credit card debt this year,” come up with a monthly plan to help you reach those goals. $10,000 broken down into 12 months, is about $834 a month. Each month, come up with a way to find those extra $834 to pay toward your loans. It could be a combination of things, such as “sell $200 worth of stuff. Reduce grocery budget by $50.” For every month, try and come up with more steps to take to reduce your debt or increase your savings. The same can be said for getting healthy and losing weight. Rather than commit yourself to a number on the scale, focus on the smaller achievable steps that will help get you to your goal weight, such as walking 10,000 steps for two weeks straight, only having dessert once a week, committing to an exercise program at least three times a week. One of the reasons people often fail at goals is because they don’t have a plan. 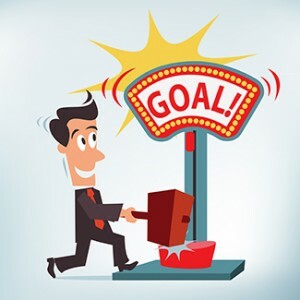 By creating a series of small steps to achieve your overall grand goal, you find that you are making strides toward your goal in a more manageable fashion. Another reason people fail to achieve their goals is because they make goals they can’t reach. Telling yourself that you will work out every day this month, when you haven’t worked out in over a year, is just a recipe for disaster. You can achieve big goals by focusing on the little things. If you haven’t exercised in a long time, any form of exercise for any period of time is still better than what you were doing before! If you know that you don’t have an extra $834 to contribute toward your debt every month, don’t make an annual goal to pay off $10,000 worth of debt! Perhaps something more manageable, like a few hundred dollars, will help you feel better about actually being able to attain your goals, rather than giving up because it becomes too hard. When it comes to sticking with your New Year’s resolutions, focus on small, monthly goals.